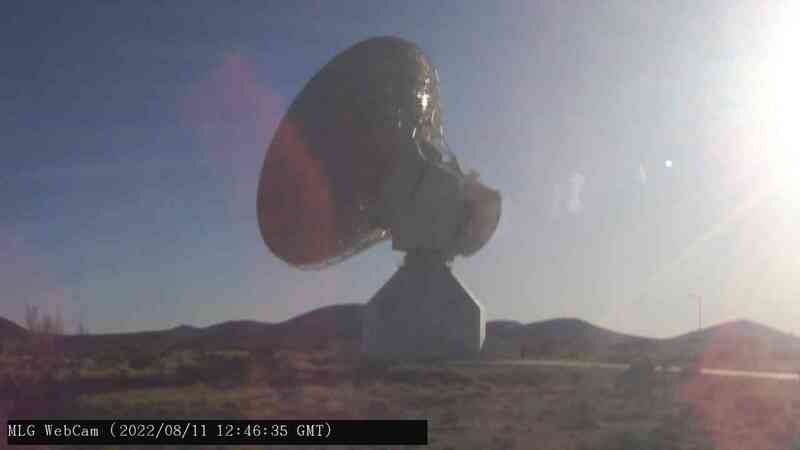 The outdoor webcam at the site of ESA's deep space tracking station, DSA 3, at Malargüe, Argentina, was switched on in May 2010 and brings you live updates from the station. The Malargüe webcam image is shown below. The camera delivers a new image every 30 seconds, and the image below will be automatically refreshed. Click here to access the full-size (704 X 576) version. The Malargüe station, Deep Space Antenna 3, is ESA's newest tracking station, 30 km south of the city of Malargüe, about 1200 km west of Buenos Aires, Argentina. DSA 3 hosts a 35 m-diameter antenna with transmission and reception in X-band and reception in Ka-band. DSA 3 entered full service in early 2013, providing daily support to missions such as Venus Express, Mars Express, Herschel and Planck. Today, it supports ExoMars/TGO, Mars Express and Gaia. Part of its operating time is used by scientists in Argentina for radio science astronomy and research. The station is located a short drive from Malargüe city, in Mendoza province. Malargüe has a population of some 23 000 and is also home to the southern site of the Pierre Auger Observatory, an international physics experiment searching for ultra-high-energy cosmic rays. The coordinates of the antenna are 35° 46' 33.63" S (35.776°S), 69° 23' 53.51" W (69.398°W), and the station is sited at 1550 m above sea level.